This home is brand new and can be rented by itself or with either or all of the other units. 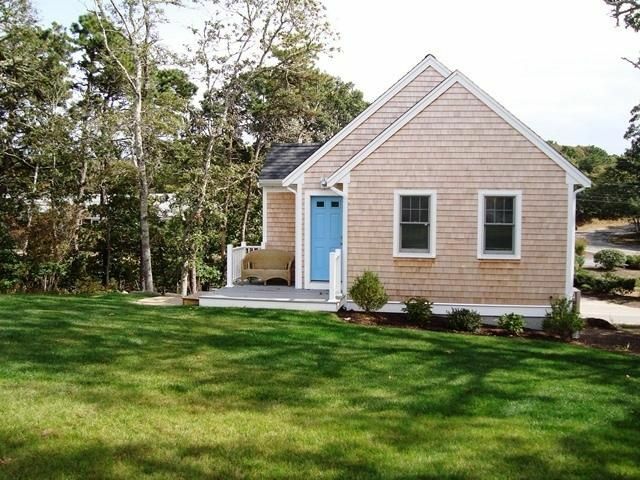 It is great for an extended family visit to Cape Cod! Inside is an open floor plan with a combined living, dining, and kitchen area. The kitchen area has a cook-top, a microwave, a toaster oven, and a small refrigerator. The high cathedral ceilings give it a spacious feel with a sitting area to enjoy the flat screen TV. This home has central AC and free WiFi. It has it's own private driveway and outside is a sitting area with a gas grill. Downtown Harwich Port is nearby for shopping and restaurants. Red River Beach, a popular family beach is only 0.9 mile away. Garage is not included with the rental, however can be rented off season for $200 a month. 1.2 Miles to Pisces for fine dining and The Box Office Cafe for pizza, sandwiches and more!